Complete! Concise! Easy-to-use! Now it's possible to have complete security and peace of mind when you're absent from your classroom. 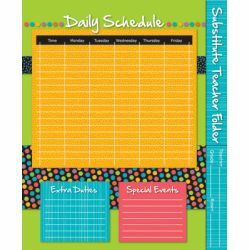 The folder only takes five minutes of your time to complete and will ensure your substitute has a great day. The 9.5" x 11.5" folder has a study inside pocket to hold extra information.